In Ghost, Castle, the main character, is real. He loves his mom dearly but is trying to figure out how to live after his father tries to shoot and kill him and his mom. On top of that, he loves his mother so much that he's willing to participate in her daily Lifetime-like movie routine and never ask for anything, even if he feels forced to turn to other methods to get what he wants so that he doesn't have to ask his mom to sacrifice. 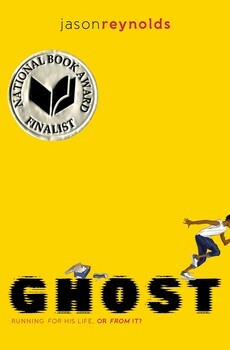 Ghost's story was so powerful to me because of this line from his track coach near the end of the novel: "Show you that you can't run away from who you are, but what you can do is run toward who you want to be" (155). And that line reminds me of the conversations I've had with a mentee so many times. You get to make a choice: you can be the person you are or the person you want to be. Overall, this was a solid read, and I'm looking forward to the sequel.